Feeding your puppy right is essential for her good health. So how should you feed your puppy? 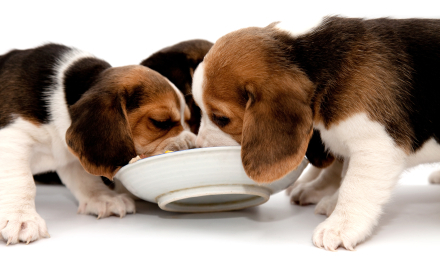 Feeding your puppy right is essential for his or her growth and development. Right now, your puppy is sitting on the highest peak of Health Mountain. ..the first 10 months of his life. The miracle of nature has brought your puppy into the world, quite literally, perfectly healthy. Unfortunately for most beautifully innocent puppies, its the healthiest they will ever be because their owners begin feeding them commercial garbage as soon as they get them home. In each stage the dietary needs change and its your job to give him what he needs to continue all the way to Stage 5 successfully. Do that, and its not an exaggeration to say you’ll have one of the healthiest young adult dogs on the planet because sadly, almost NO ONE else will bother to do it properly. NEW! Puppy feeding recipes & advice for the 5 stages of feeding. Available only with the Dog Food SECRETS Gold Pack. CLICK the image to read about the Gold Pack now. For example, did you know a puppy requires about 25% more protein? And its not only nutrient differences, you also have to consider food texture for proper tooth development. 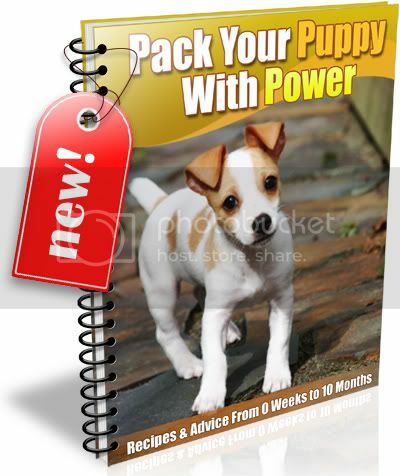 After requests from our readers we added a new guide to the Gold Pack called “Pack Your Puppy With Power”, which contains advice and recipes for each of the stages of puppy feeding. If you want to be still having fun with your dog when others of the same breed have already become old-before-their-time and died, then begin now… that’s the true EDO spirit. I have tried the tuna egg and cheese on the video my dogs love it. i will try some others also. thanks for all the great advice. I am getting ready to get a pomeranian puppy to keep sweety company. Will all the recipes I got from you be alright for the pomeranian puppy too?